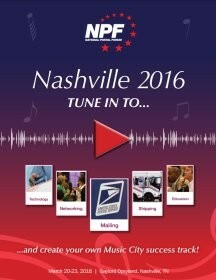 The National Postal Forum will meet in Nashville, TN March 20-23, with the exhibit floor being open on March 21 – 23. The NPF is the premier show to demonstrate and learn about the latest in mailing technology and techniques. There are educational sessions discussing USPS, postal news, Direct Mail, and general business subjects, with several professional certifications offered. The exhibit floor allows you to explore the latest in the world of mailing and printing hardware and software. The NPF is always a good show. You should catch it any time it’s near you.